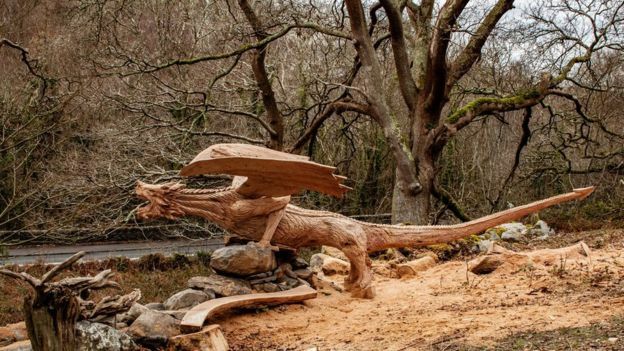 The 25ft carving, called Y Ddraig Derw - The Oak Dragon - looks down on the A5, near Tregarth, Gwynedd. Sculptor Simon O'Rourke, who made the dragon, also urged motorists to pay attention to the road. 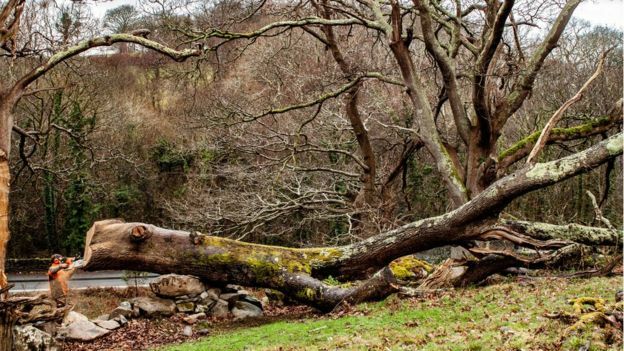 North Wales Police said that while they "love the oak dragon" they were "concerned" about road safety issues. "There has already been one accident and numerous near-misses on this section of road which really does require a driver's full concentration," said the force in a post on its Bangor and Bethesda Facebook page. "Please concentrate on the road ahead at all times, if you want to view it, then please find somewhere safe to park." Mr O'Rourke had also warned motorists it was a "fast and dangerous road" on his Facebook page while the carving was being created. 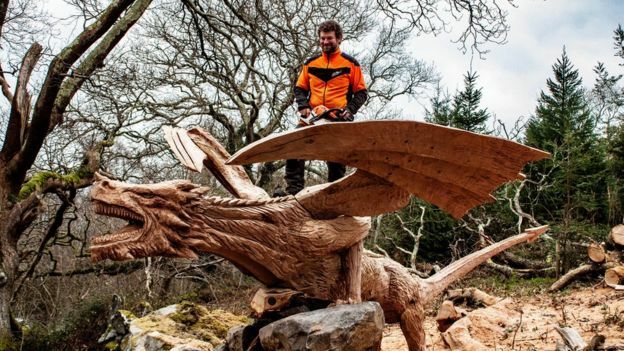 He spent nearly a week last month wielding a chainsaw to carve the dragon from a fallen oak branch at the request of the property owners. Mr O'Rourke, 40, from Wrexham, said: "You drive through somewhere like Birmingham and you've got huge screens and billboards that are actually trying to distract you and catch your attention. 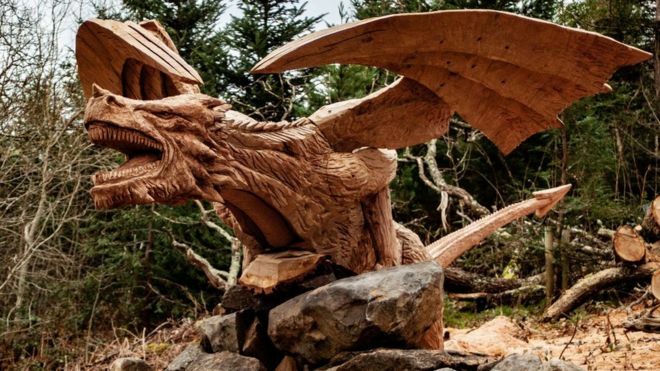 "A wooden dragon is less intrusive than those screens but I think it's just the case that it doesn't matter what happens, when you're in control of the car you should be paying attention to the road." So if motorists aren't supposed to be looking at it, then what's the point of it? Nice carving. I got a shirttail relitive that carves eagles. Complete with moving feathers. They have about a 6 ft wingspan. It's hard to imagine how such a dumb bunch of bunnies managed to conquer a 1/4 of the planet. It's like wonderong how the hell the USA remains a super power in spite of it's gormless populace. Jesus sculpture prompts police calls in Sarnia, Ont. My personal Public Safety Warning for anyone in Ontario, Canada.